As some of ya know, I started a bike blog documenting all my bike related adventures, from early morning bike rides to racing to other bikey type stuff. Most mornings, especially during the spring, I'm on my bike training at the crack of dawn. It's a little nutty, but once you cross the Golden Gate Bridge and see a view like the one above, it makes it all worth it for me. Anyway check it out if it interest ya: Ride & Shine. The only souvenir I brought back from my trip would happen to be a little yellow bicycle. Morning Ride (w/ my teammate) We meant to go on a short and flat ride, but since the sun decided to shine we extended our ride a bit to include some hills and lovely views. Afternoon Ride (solo) Later I hopped on my other bike and explored the park for cherry blossoms. Luckily for me, I found a bunch in full bloom. Wee. Here's another taken from last year. I've been pretty busy the past few weeks, so it's been a little tough to take an actual photo every day. Luckily, I have a huge back log of photos that have yet to see the light of day. I must say, I have a ton of respect for those who can manage a 365 project, some day I'll actually attempt it, but for now my current project works for me. Spent this gorgeous afternoon biking from one park to another for a product shoot. It was sooooo nice to be out and about for a bit. Love how some of the riders sort of vanish. This was taken using the HDR setting on the iPhone. of Miss. Vu and her bicycle. Here's another spoke card design I did for Bike to Work Day but didn't make the cut. This design also included a version that was yellow and blue with a bike that had a top tube and flat handle bars. The bike has also been swapped, but any bike could work. On a side note, I used Kim's bike as a base for most of the bikes seen on the e-cards and the other spokes cards. In addition to designing ecards, the Bike From Work Party flyer and other design & production duties for Bike to Work Day, I also got to design a set of spoke cards for the big day. The spoke cards were given away for free as part of the swag found in the Bike to Work Day tote. I presented a couple of different design ideas and this was winning design. Aside from red-magenta/yellow combo, the spoke cards also came in three other colors combos: Fun stuff. This was definitely one of my favorite pieces to work on. I loved the idea of showing a variety of bikes, rather than just one kind. Just as there are many different types of jobs people have, there are also many different types of bikes people ride. As long as people are riding bikes for everyday commuting, in the end it really doesn't matter what kind of bike you ride, as long as you just ride. More design work for the San Francisco Bicycle Coalition! Photo done by yours truly featuring one my favorite people. The printed pieces turned out really nicely (this photo does not give it justice), not too shabby for one of those online printing sites. Bike to Work Day Ecards! Stay tuned for more BTWD designs! For some reason this year, cycling has become one of the most important aspects of my life. I've graduated from just using a bike for commuting around the city and entered the world of 30-50 mile weekend bike rides, climbing hills (for fun), riding for fitness, carbon road bikes, and (gasp!) lycra and cycling jerseys. Maybe I needed something new to focus on this year since college and homework is a thing of the past and now all of the sudden I had all this free time to, you know, have fun and be active. Whatever the case, I'm loving this new aspect of cycling and will only continue to push myself even further. Pacifica part 2! This time with gears! The beach you see off the One. Larkspur Path after finishing Paradise Loop in Marin County. 50 miles round trip. My first half century! Crappy photo taken with my (old) iPhone. Ice cream break in Tiburon! Spoke card from this year's Supermarket Street Sweep. This year's card featured the various portraits taken at last year's event. One of the volunteers recognized me and gave me the card with my photo on it! Yay. As for the race itself, I barely took any photos for this course proved to be tougher and hiller than last year. 30 miles around SF with the first check point being in Daly City. Craziness. Needless to say, I spent my time hustling up hills rather than taking pictures. 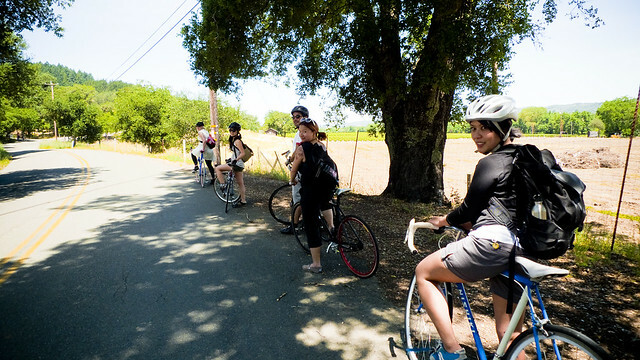 Photo by Rob Villanueva Dry Creek Loop/wine country ride from earlier this year. A fantastic day of easy biking through Healdsburg, wine and friends. Bike pile at one of the wineries. I love the change and hardly miss the drops. The only significant difference is that since the bars are slightly wider, it's a little tricker squeezing in between traffic. Otherwise, it's a far more comfortable ride now.